We have been eating a lot of short ribs lately. They’re always a delicious comfort food that can be thrown together in the early afternoon, then braise away in the oven for a few hours while you go about doing other productive things in the house…or maybe, take a nap – then wake up to the smell of a delicious meal bubbling away. This is another recipe I sent over to my friends at Avalon Winery, along with the red wine cupcakes. 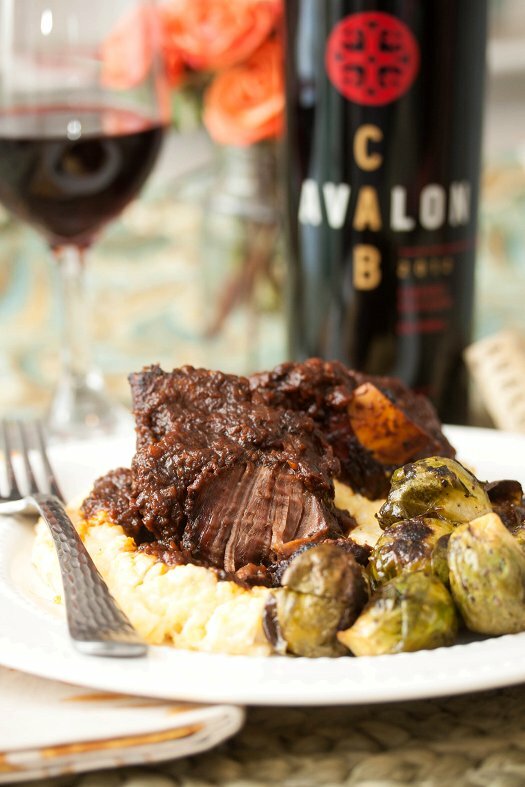 It was a spin off my first short rib recipe, but I chose to braise them in a delicious Cabernet and a bit of coffee too – for some added richness. The gravy that came out of the bottom of that pan was pure deliciousness. I served them over a bed of grits, as kind of a nod to our trip to Charleston. Grits are the perfect vessel to soak up delicious flavors from gravy, and it’s a nice change from the standard mashed potato that I usually find myself turning to in these kind of applications. This would be a perfect meal for Valentine’s Day – especially where so many of you guys are buried under a bunch of snow. Just throw the meal together and let it do it’s thing, then go about your business preparing a beautiful table setting. I served with some roasted Brussels sprouts (I have a recipe for that coming soon!) and it really was a delicious and impressive meal that we all enjoyed. Plus, there’s plenty of wine left in the bottle to enjoy with that someone special. Win-win! Season each short rib generously with salt and pepper. Coat a large dutch oven or brasier with olive oil and bring to a high heat. Add the short ribs to the pan and brown well, about 2 to 3 minutes per side. While the short ribs are browning, puree all the vegetables and garlic in the food processor until it forms a coarse paste. When the short ribs are very brown on all sides, remove them from the pan. Add the pureed vegetables to the hot pan. Season the vegetables generously with salt and brown until they are very dark and a crust has formed on the bottom of the pan, approximately 5 to 7 minutes. Scrape the crud and let it reform. Scrape well with a wooden spoon and add the tomato paste. Brown the tomato paste for 4 to 5 minutes. Add the wine and scrape the bottom of the pan with the wooden spoon to loosen the browned bits. Reduce the mixture by about half. Return the short ribs to the pan and add the coffee, and enough water to cover the meat if necessary. Cover the pan and place in the preheated oven for 3 hours. Check periodically during the cooking process and add more water, if needed. Turn the ribs over halfway through the cooking time. Meanwhile, cook the grits. Place the milk,water, and the grits into a 2-quart saucepan. Cover, and turn the heat to medium high. When mixture comes to a simmer add butter, and 1/2 teaspoon salt, and reduce the heat to medium. Stir every couple of minutes until the grits have become fragrant, and are the consistency of thick soup, about 8 minutes. Reduce the heat to low and simmer, stirring often and ever more frequently, for about 20 minutes. Add 1/2 teaspoon black pepper and cook for about 10 minutes more, stirring constantly to prevent the thickened grits from scorching. If your grits thicken too quickly, or if they are too gritty for your taste, add water by the half cup, stirring to incorporate, and continue cooking until tender. Season with salt and black pepper to taste. Set aside and cover to keep warm. When done the meat should be very tender but not falling apart. Serve the short ribs with the braising liquid over the grits. These look amazing! We have a short rib obsession at our house. These look so, so good! I can’t wait to try them out, soon! What was the oven temp on the short ribs please?